The speed and convenience of precast with the structural integrity of a slab. That’s the claim for Austral Deck. But does it stack up? 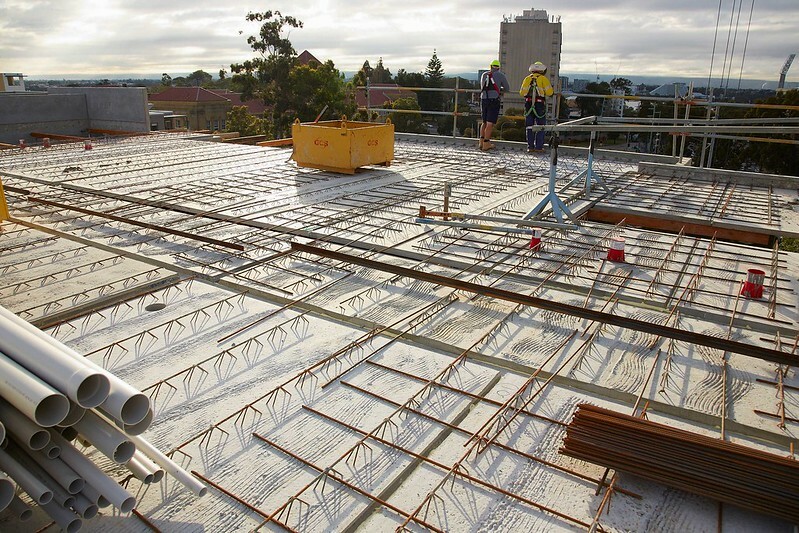 Those are the five key advantages offered by Austral Precast’s Austral Deck flooring system. So what is the Austral Deck system and how does it work? Conventional suspended concrete floor slabs are cast in situ on a formwork base, sometimes timber or often a metal ‘tray’, which is supported at frequent intervals by a forest of props. The formwork is then fitted with reinforcement mesh, and concrete poured and screeded to the finished height. It sounds simple and basic … and it is. It’s also very slow, and time is money, no more so than on a large commercial or multi-residential project. The Austral Deck system however combines the speed of precast elements with the considerable structural qualities of a monolithic floor slab. Here’s how it works. The Austral Deck elements, let’s call them concrete planks, are precast in lengths up to 12 metres and a standard width of 2.5 metres. Thicknesses vary from 60mm to 75mm and 90mm, to suit the required loading specification. Like all precast concrete products, each unit is custom made, with dimensions to specification. The plank is reinforced and also has multiple rows of triangular truss reinforcement (steel lattice girders) following the length of the plank. These are embedded into the precast plank and significantly increase both the strength and the unpropped span of the Austral Deck. 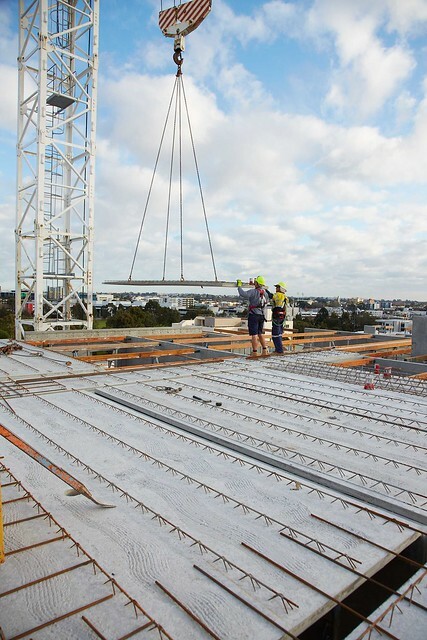 After curing, the Austral Deck planks are then transported to site and craned into position, instantly creating a strong, safe working surface that will easily carry the load of trades and their materials. This means work on routing floor services can begin immediately. 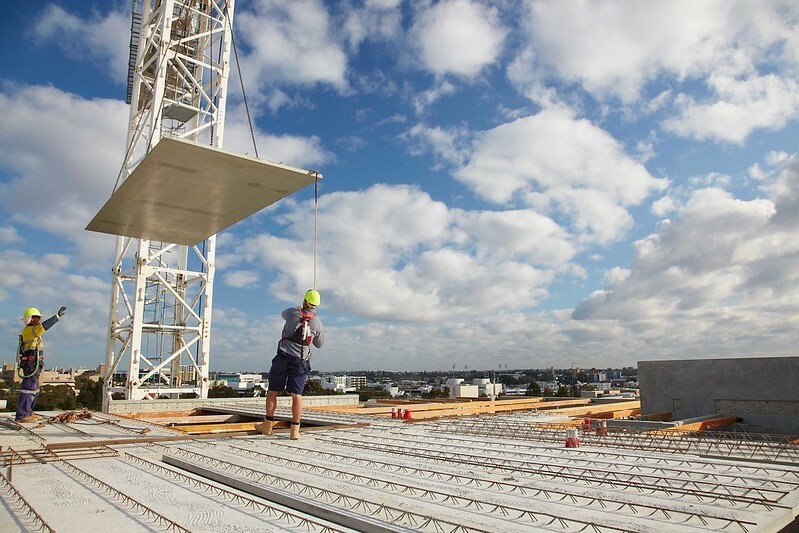 To get a better idea of the product from a users perspective we spoke to a leading Perth builder, Rodney Naef, about the use of Austral Deck on an eight-storey apartment building as it approached the end of its structural phase. The project, Vibe Apartments, is located in Wellington Street, East Perth close to the restaurant and cafe life of this newlyregenerated inner suburb. Once completed in early 2015, Vibe will have sixty apartments, mostly one- and two-bedroom, including five two-storey penthouses, as well a gym, pool, two levels of parking (one below grade), and even a rooftop garden, outdoor theatre and viewing deck. Rodney Naef of Ren Construction is an old hand when it comes to building in precast, both walling and flooring, and his enthusiasm for the Austral Deck system is undimmed. How does this compare with the Austral Deck? 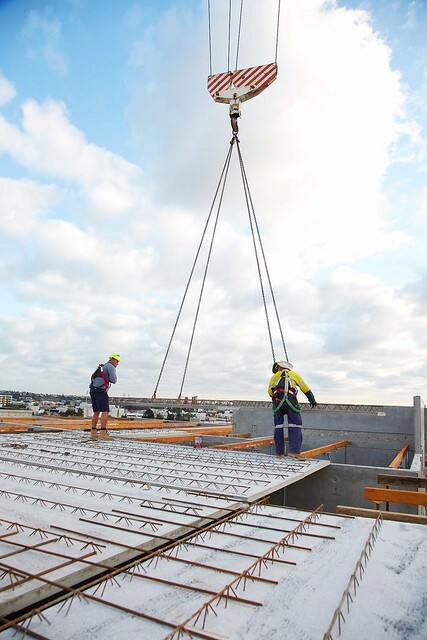 “With the Austral system we ‘d be backpropping for a day, maybe a day-and-a-half, and the next day you’ve got a whole level covered !” According to Austral Precast, an average of ten Austral deck planks covering an area of 150 square metres can be installed per hour. As well as supplying 533 Austral Deck planks, Austral Precast also manufactured 736 precast wall panels for this project, 75 upstands and 28 precast stairs. “The stairs are craned in off the truck, lowered straight in,” to the fire–rated stairwells made from precast panels, of course, “and there’s your access immediately,” he says with enthusiasm. As we talked to Rod, the final level of the Vibe Apartments project was being poured and the structural phase was all but complete.